Power Buggy Rental – Stone Mud Buggy – SB1600, is available for rent in Rochester NY, Ithaca NY and the entire Western New York region from the Duke Company. 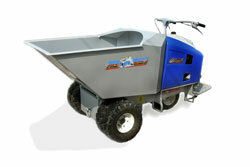 This 16 cubic feet power buggy is highly capable of moving concrete, gravel and other materials through-out the job site. The unit is powered by an efficient and powerful Honda GX390 engine.